Scotland is one of those places that changes you. It’s beautiful and rugged. It’s full of history, legends, castles, and remnants of lives lived before our time; it’s full of love stories, and life stories. Join me on my 7 day Scotland Photography Workshop and make this incredible place part of your story. 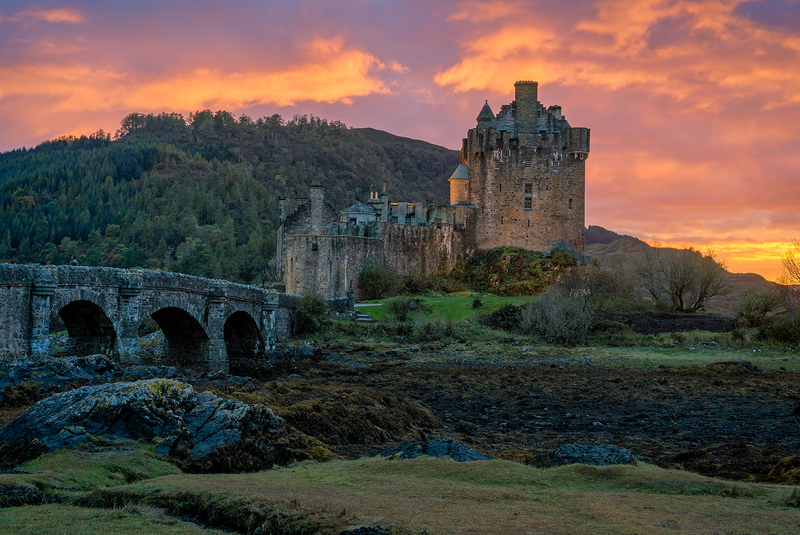 I will show you how to capture the magic of Scotland while teaching you how to create fine-art quality images. 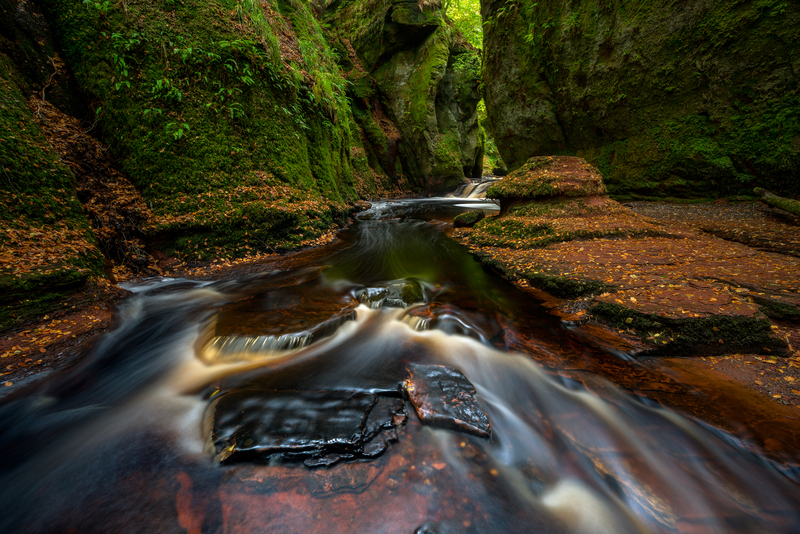 This Scotland Photography Workshop has a maximum capacity of 5 participants. With limited registration, you will enjoy attentive one-on-one instruction each day. Don’t let the limitations of your camera prevent you from learning like a pro. Sony is supporting this workshop with a variety of cameras and lenses for you to try. This is a unique opportunity to try a full frame camera if you don’t own one already, or test the performance of your current camera setup against Sony’s lineup. Participants get themselves to Glasgow. I recommend arriving the day before (on October 3rd for the first group, or October 10th for the second group) and spending the night at the airport. This will allow the workshop to start on time, even if flights are delayed, as well as give you time to adjust to the the time difference. I like the Holiday Inn Express at the Glasgow airport, as it is only a 3 minute walk from the terminal building, and it’s comfortable. We can meet for drinks and a gear check on the evening of your arrival. I will pick everyone up from the airport on the morning of the 11th to start our adventure! Our first stop on the Scotland Photography Workshop – at the Devil’s Pulpit – will be sure to fill your first memory card. 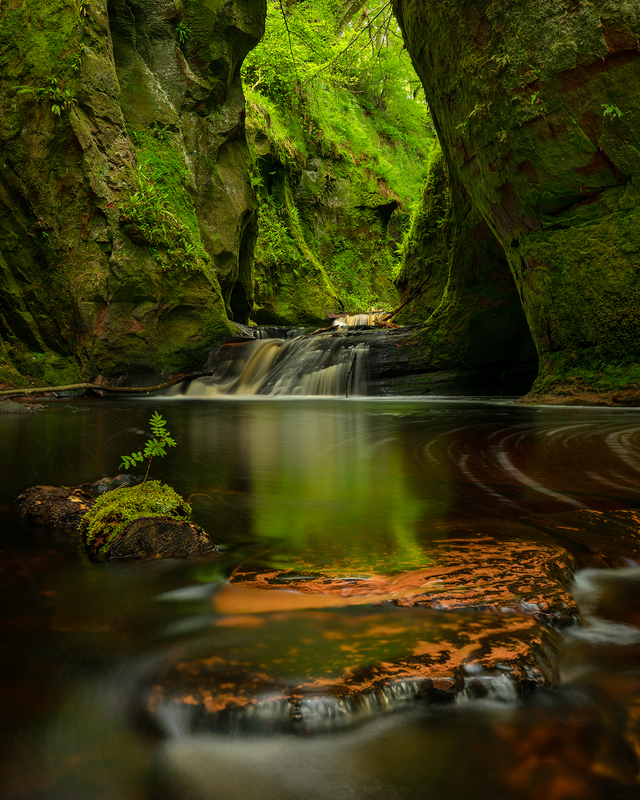 The walls of Finnich Glen glow green, the earth is red, and the water pours over the small falls like a fountain of white and milk chocolate. There are endless compositions to be found here, as the water swirls and pools throughout the glen, and the green walls reflect in the water. 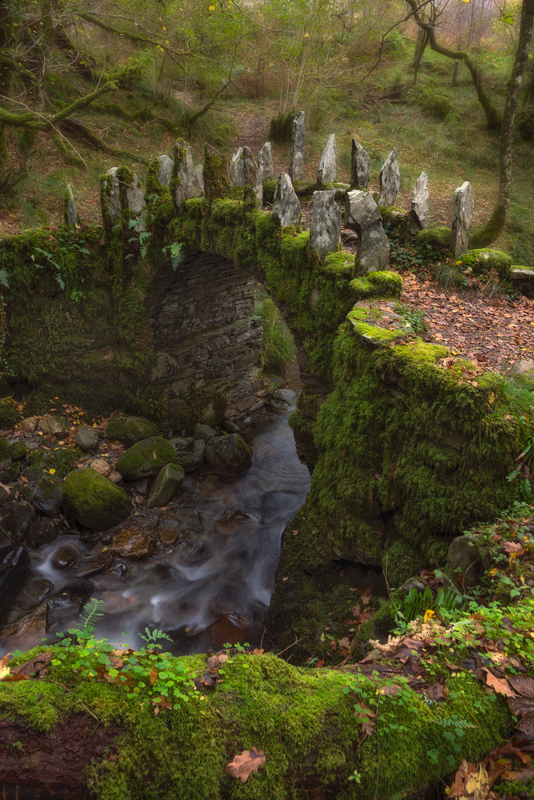 You will still be giddy after your shoot at the Devil’s Pulpit by the time we make our way to our first castle. 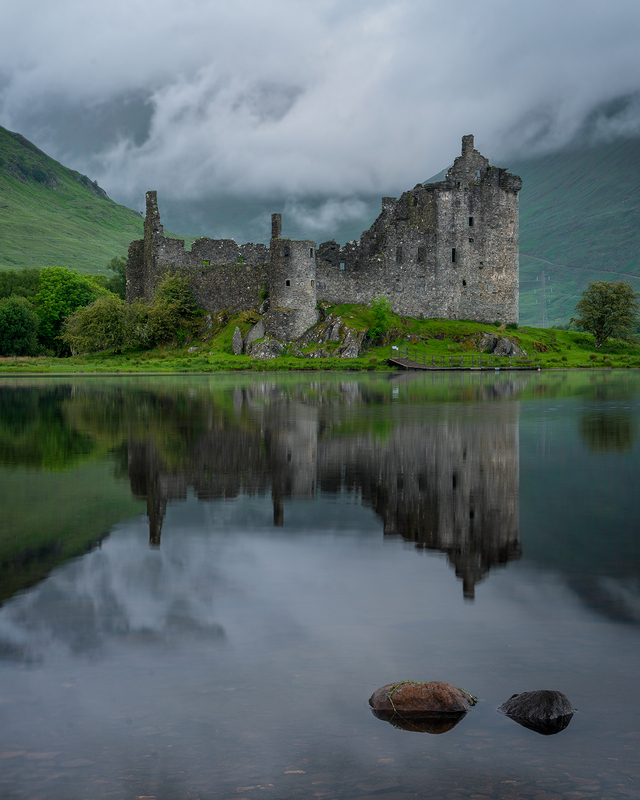 Kilchurn Castle, first constructed in the mid-15th century, stands like a sentinel on the shores of Loch Awe. You can’t help but be transported back through time as you stand on the bank looking across the water. We will visit this historic site for sunrise on our way to Glencoe. Chances are good for capturing some morning mist, and maybe even a rainbow (or two!). The water is often calmer in the morning, too, for some nice reflections. Shoot 4 – All aboard The Hogwarts Express! Calling all Harry Potter fans! All aboard the Hogwarts Express! 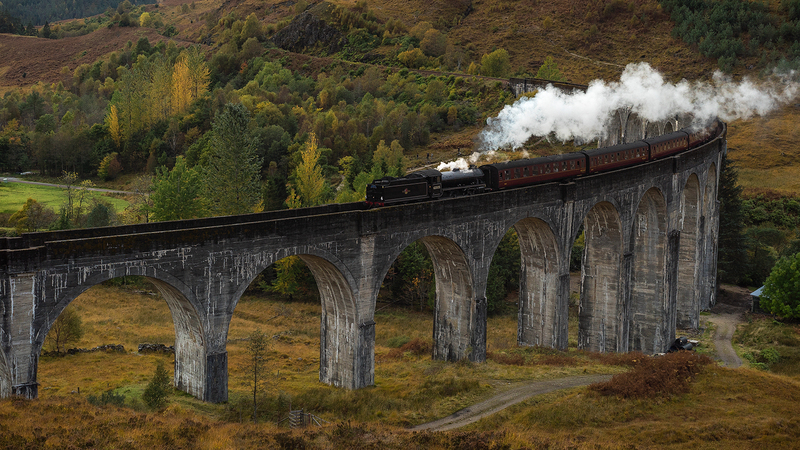 I have to admit that I’m a huge Potter geek, but even if you’re not a Harry Potter fan, this old-fashioned steam train over the Glenfinnan Viaduct is truly inspiring. I will take you to the best vantage point for the light we get that day. On our way to the viaduct we will have time to stop off at the historic Inverlochy Castle for high tea. This is a good opportunity to get a bite to eat, and explore 19th century Scotland. Picturesque Buachaille Etive Mor in Glencoe. Glencoe is one of the most historically significant locations in Scotland. It’s one of those places that feels like where ever you go, somebody, at some time in our history, was there before you. 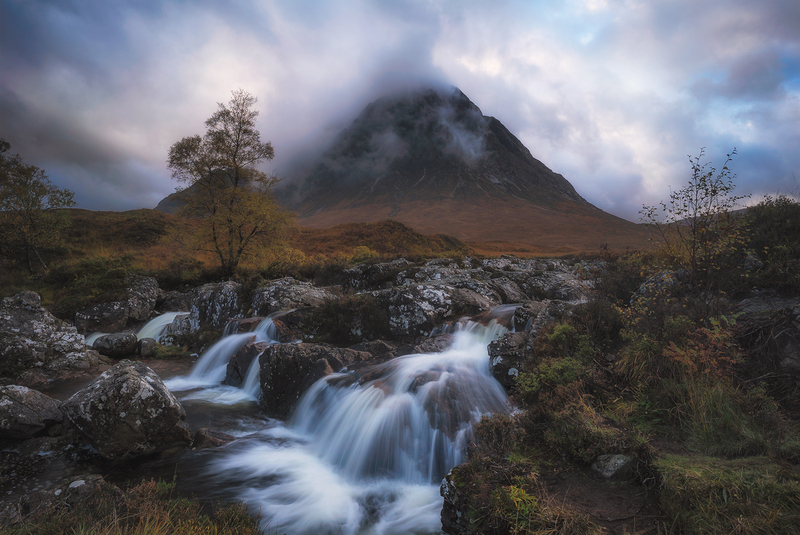 At the same time, it is remote, rugged, and untouched – like the tumbling falls under the shadow of Buachaille Etive Mor. 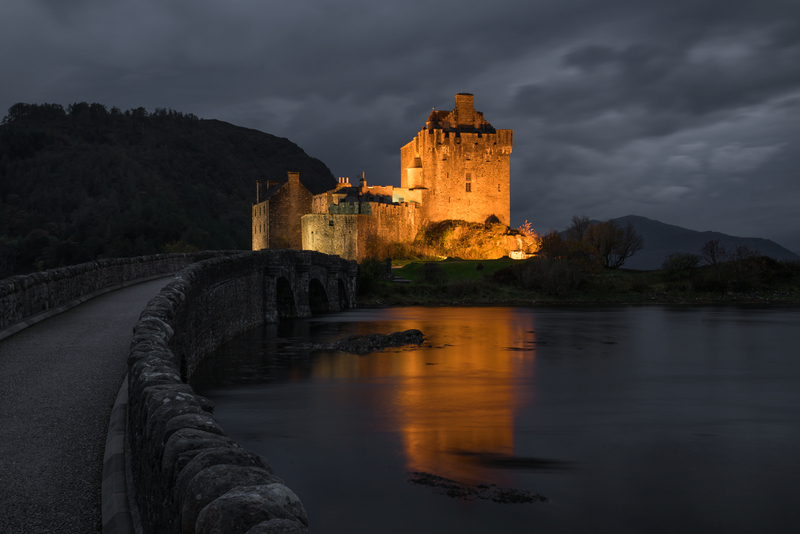 One of the most quintessential Scottish castles is undoubtedly the majestic Eilean Donan Castle. During my October, 2016 trip, I arrived just in time for one of the most spectacular sunsets I have ever seen. The sky was on fire, and the dazzling light continued for nearly an hour before the sun disappeared below the horizon. During blue hour, the exterior of the castle is lit with soft orange light that makes this quintessential castle pop against the deep blue of the fading light. 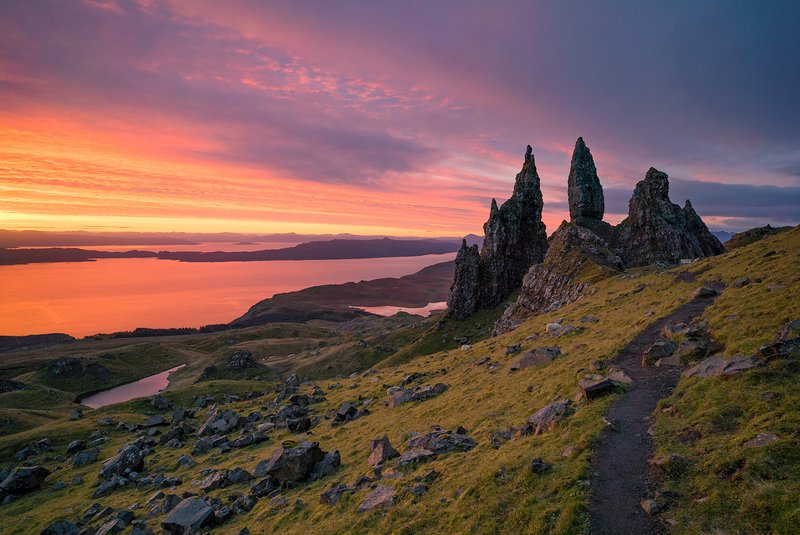 The Old Man of Storr will transport you to places you’ve seen only in your imagination. It has a Lord-of-the-Rings, middle-earth vibe to it. And, it’s another one of those places with endless compositions. Make sure you have lots of space on your memory card and some extra batteries! Neist Point offers a feast of dramatic cliff faces and crashing waves. With the lighthouse perched precariously on the edge of the cliffs and facing into the North Atlantic Ocean, it’s sure to lure your imagination. 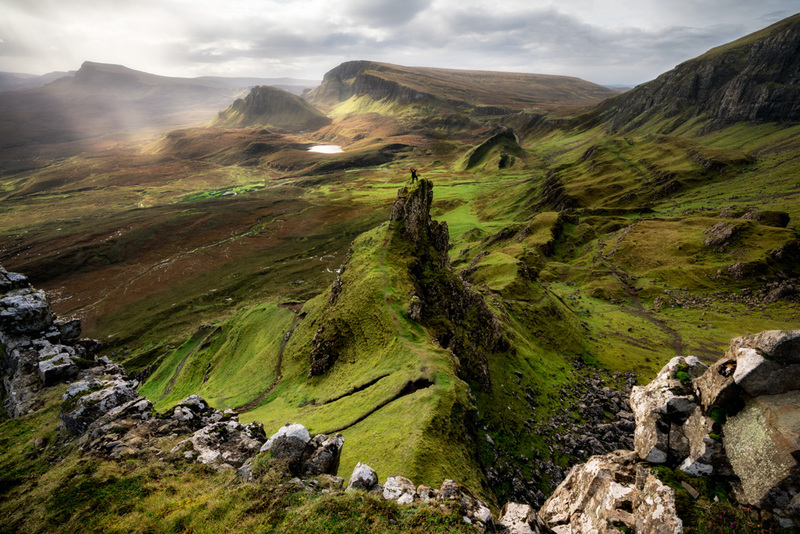 Much like the Old Man of Storr, visiting ‘The Quiraing’ is like stepping into another realm. Gnarly rock formations, and deep green meadows create an endlessly textured landscape. The morning sun reveals fascinating details and depth to this unique landscape. Scotland isn’t all jagged rocks and meadows. It also boasts some beautiful, waterfalls and the deep blue Fairy Pools. We will spend the afternoon exploring this enchanting set of falls. The Fairy Glen has an enchanted feel to it, with it’s bizarre stone circles and rock structures. 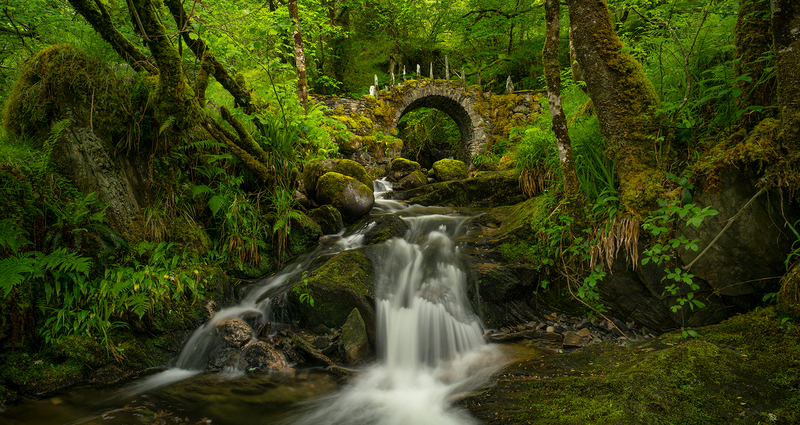 They say that if you stand very still and quietly in the vicinity of the glen, you may hear leaves rustling or feel a faint wisp of breeze – the work of the fairies! 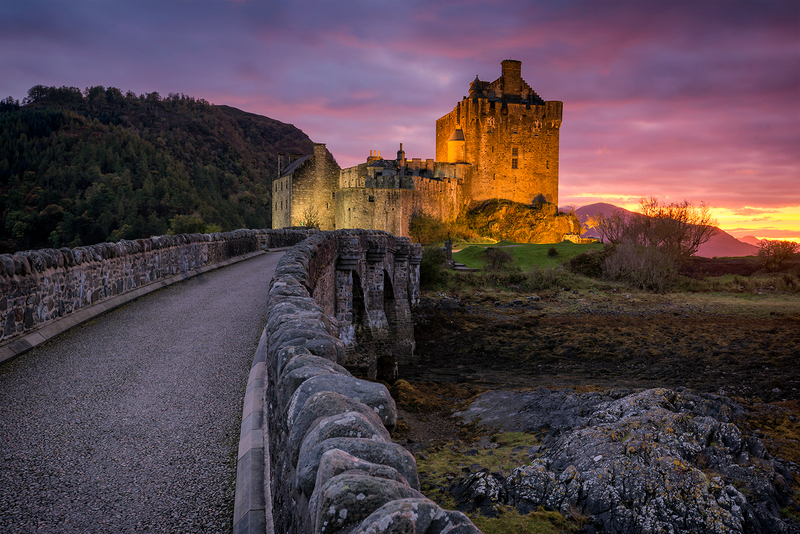 We say goodbye to the Isle of Skye this morning, but we get one more opportunity to shoot Eilean Donan Castle for sunrise. After sunrise we will step into what can only be described as a fairytale forest. I call this place the ‘Fey Realm.’ This forest is reminiscent of the storybooks you read as a child with ogres that live under bridges. Sunrise is the perfect opportunity for calm waters around the towering Castle Stalker. Hopefully we get some of that magical Scottish mist, and gorgeous reflections in the loch. We have some time for one last visit to a favourite spot, or a place that we just didn’t seem to get the conditions we were hoping for. 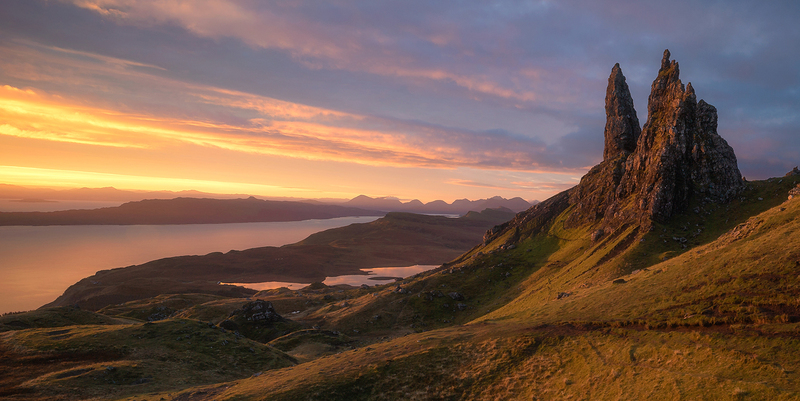 As seen in the images on this page, any time of day can offer great light in Scotland during October. We will drive back to Glasgow after our last shoot at Glencoe for a farewell dinner, drinks, and laughs. A *sturdy* tripod with a ball head. We can’t emphasize enough how important it is to have a solid tripod. Many people spend thousands of dollars on cameras and lenses, and mount their gear on a flimsy $60 tripod. If you invested money in a camera, don’t risk damaging it by putting it on a tripod that won’t stand up to wind and weather! Insurance – It is MANDATORY for you to have travel insurance for yourself. I also highly recommend insuring your photography gear. Tour leaders will not be responsible in the event of any personal injuries or damage to photography equipment as a result of an accident during the workshop. Most of the shooting locations on the Scotland Photography Workshop are close to car parks and require very little hiking. 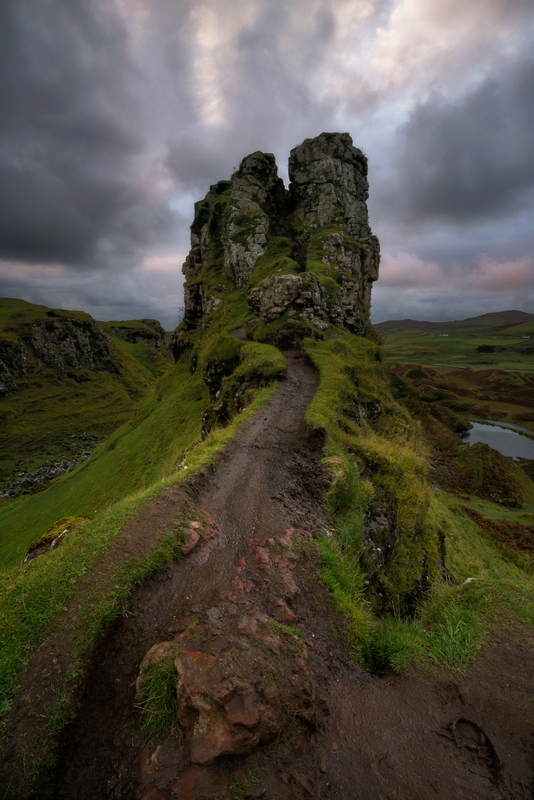 The exception is the optional hike to the ‘Old Man of Storr’ which takes about 1 hr up a steep hill. If you aren’t up for this hike, you can still capture great shots at the start of the trail. All other locations are short walks from the car. There will be some down-time between shoots, as well as in the evenings to process the images from our trip. Make sure you bring a laptop that has Photoshop, Adobe Bridge, and Lightroom or ACR installed. I also like Nik (a free software from Google). Trying to install programs while on the trip may prove very difficult with limited internet services. Come prepared to get the most out of our post-processing sessions! 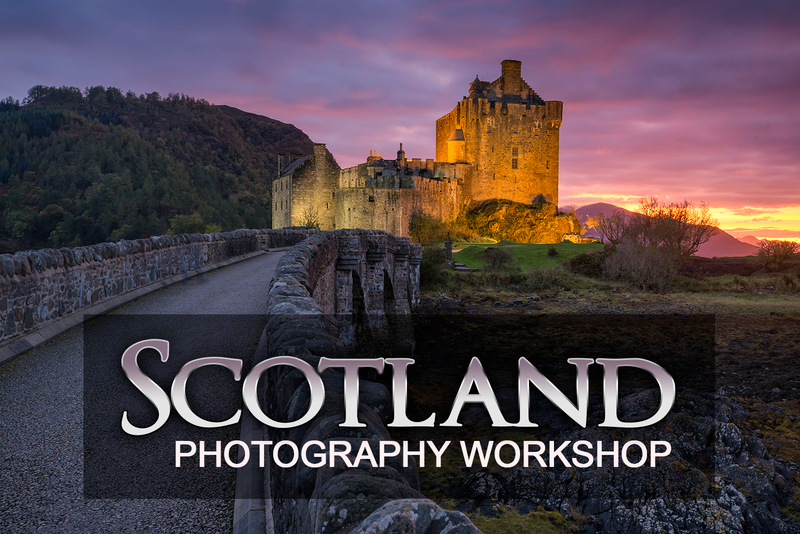 I look forward to working with you on the Scotland Photography Workshop!